Islamic State militants have claimed responsibility for attacks on the Syrian city of Homs which killed at least 16 people and injured dozens more. The militants said their fighter blew himself up with 150kg of explosives near a central city hospital. The incident happened near a hospital in the al-Zahra neighborhood of the city. The area has seen several bombings. It is home to the Alawite minority, to whom the ruling elite in Syria belongs. Syrian state television described the attack as "two large terrorist explosions." The second explosion reportedly took place in a nearby shop a few minutes after the car bombing detonated. At least 16 people have been killed and 54 others injured. Some are in a critical condition, Governor of Homs Talal al-Barazi told SANA. The agency cited a source close the incident, saying a car packed with 150 kg of explosives was parked in a street near a charity association and al-Ahli Hospital. The casualty count is not yet final as emergency services are responding to the attack. RIA Novosti has already reported 22 people were killed and 70 more sustained injuries, citing medical sources. Unconfirmed reports on Twitter put the number of those wounded at 140. The western Syrian city was targeted as government and rebel forces contesting the city agreed this week to establish a ceasefire, a move touted as a major breakthrough for a political reconciliation in Syria. 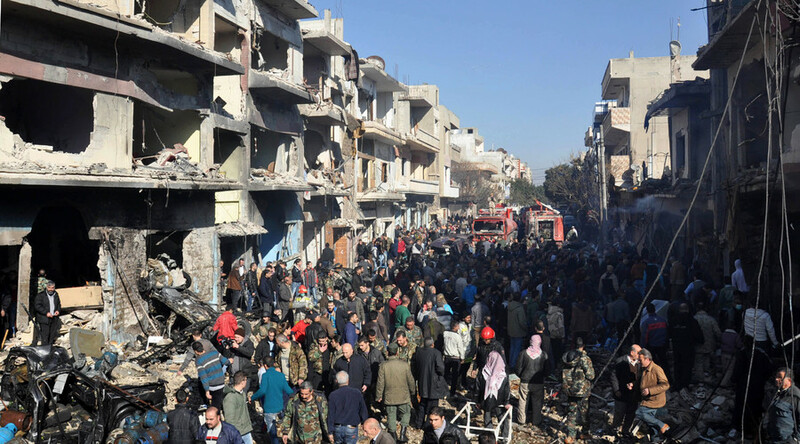 The bombing in Homs happened days after a triple car bombing in the predominantly Kurdish Al Hasakah province, which claimed some 60 lives and left dozens injured. The attack on Thursday targeted a Kurdish militia hospital and a crowded marketplace. Islamic State (IS, formerly ISIS/ISIL) claimed responsibility for the bombing. Syria has been engulfed in violence since 2011, when extremist groups hijacked anti-government protests. The country is torn between numerous factions, including several rival jihadist groups and is being riven by a complex conflict involving several regional and global players.